This child-rearing book has been a runaway success in China. Only recommended for parents who are proficient in Chinese. 344 pages. Simplified chinese. Soft cover. The Writers’ Publishing House has so far printed 1.7 million copies since the book was published in January 2009. Only four months after it was published, the book jumped to No. 1 of the bestseller list at one of China’s biggest online shopping websites: www.dangdang.com. In this book, the author, Yin JianLi shares her views on how to be a great mother. Yin advocates developing children’s potential without forcing them to accept adults’ views, has been greatly welcomed by Chinese readers. The author urges parents to allow their kids to take reasonable risk, and to give them room to make mistakes. 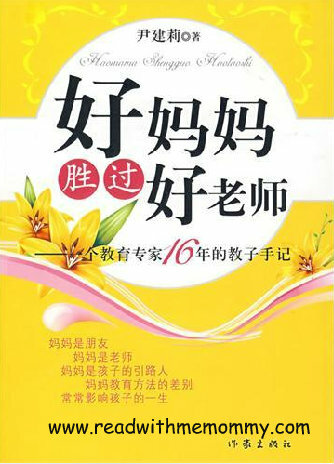 She shared in this book how she encouraged her daughter to travel alone for 17 hours by train in the eastern coastal city of Yantai to Beijing at the age of nine. She also advises parents on how they can help their kids better cope with school pressures. "Kids shouldn't be slaves of homework". This book is a refreshing change to the recent popular titles, such as the Battle Hymn of the Tiger Mother and Harvard Girl: Liu Yiting'. Read more about the author and her book in this link.